Anteaters are common in lowland and middle-elevation habitats throughout Costa Rica. Anteaters are purists and subsist solely on a diet of ants and termites, plus a few unavoidable bits of dirt. There is no doubt about what the best tool is for the job–a long tongue with zillions of microscopic spines. The anteater’s toothless jaw is one long tube. When it feeds using its powerful forearms and claws to rip open ant and termite nests, its thong of a tongue flicks in and out of its tiny mouth, running deep into the galleries. Each time it withdraws, it brings with it a load of ants, which are scraped off inside the tunnel of its mouth and swallowed, ground down by small quantities of sand and gravel in its stomach. 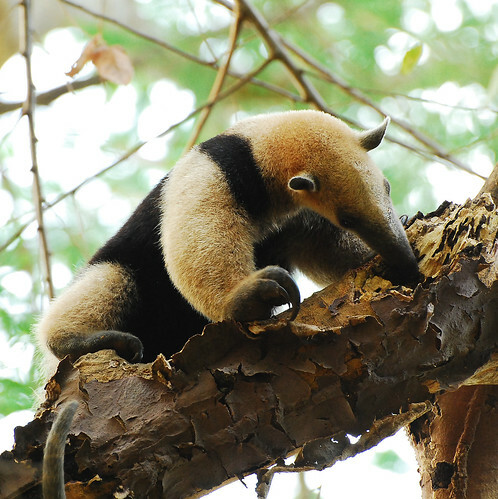 The most commonly seen of Costa Rica’s three anteater species is the tree-dwelling lesser anteater (or tamandua locally), a beautiful creature with a prehensile tail and the gold-and-black coloration of a panda bear. It can grow to 1.5 meters and weigh up to eight kilograms. One of my fondest memories is seeing a tamandua climbing down a tree in Santa Rosa National Park. When it saw me, it climbed back up again! The giant anteater, with its huge, bushy tail and astonishingly long proboscis, is now restricted to the less sparsely forested areas of the Osa Peninsula. It can grow to two meters long and when threatened rears itself on its hind legs and slashes wildly with its claws. It also raises its tail over its head. Even machetes cannot cut through the tough bristles; thus the fearsome critter is revered among campesinos for its magical abilities. At night you may with luck see the strictly arboreal, cat-sized silky anteater, which can hang from its strong prehensile tail. Posted in WildlifeTagged Anteater, Conservation, Costa Rica, eco, Giant, Lesser, Osa, Silky, Tamandua, Travel, Vacation, WildlifeBookmark the permalink.